Thripunithura Hill palace, the largest archaeological museum in Kerala and the erstwhile official residence of the Kochi Royal Family, was built in 1865. 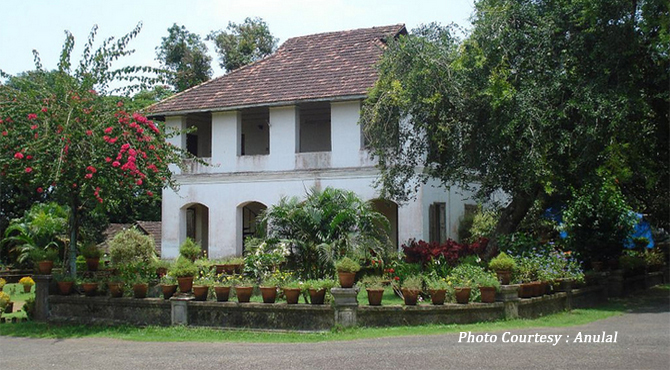 Hill Palace is situated at a distance of about 12kms from Kochi on Ernakulam- Chottanikkara route. The palace complex consists of 49 buildings in the traditional architectural style of Kerala and is surrounded by 52 acres of terraced land with ponds, fountains and lawns. A full fledged ethno archaeological museum and Kerala's first ever Heritage museum are the main attractions here. The oldest building in the complex is a single storeyed Kerala style 'ettukettu' constructed around 1850 AD with an adjacent pond, temple and urappura. The other buildings are a combination of traditional and western architecture. The latest construction was a three storeyed western style building constructed in 1950 which used to function as the office. Traditional 'Nalukettu' at the northern end of the palace has been renovated with intricate wood carvings, Kulapurars have been renovated by repairing the compound walls and replacing the tiles etc. The collections displayed in the museum are mainly from the Travancore Royal House, Paliam Devaswom and from the department of Archaeology. It has a gold crown embedded with precious stones and many valuable coins, ornaments, majestic beds and samples of epigraphy. The museum also displays 200 antique pieces of pottery and ceramic vases from China and Japan, Kudakkallu (tomb stone), Thoppikkallu (hood stone), menhirs, granite, laterite memorials, rock cut weapons belonging to the stone age, wooden temple models. There is an amazing array of plaster cast models of objects from Mohanjodaro and Harappa of the Indus Valley civilization of North India. The museum also houses a gallery of contemporary art. Paliam gallery in the museum contains the collections donated by the Paliyathachan's family. Paliyathachan's were hereditary Prime Ministers to the Cochin Maharaja’s for a long period. This gallery was opened in 1991. The gallery of cabinet Hall displays royal furniture's including the 'Simhasana' (the throne or the king's chair). Exhibits in the numismatic gallery are dinarius (roman silver coins), punch marked coins, coins during the period British period etc. In Portrait gallery, oil portrait of the Maharaja’s of the Cochin State are exhibited. This gallery also contain certain thanjavur paintings. Various wood carvings which are part of Enadimangalam Temple belonging to14th century as well as unique ivory items, wooden sculptures etc are displayed in Wood Carvings gallery. Heritage museum which was opened in 1995, exhibits traditional household utensils, art effects and religious worship materials. In weapon gallery and Sculpture gallery, old weapons collected from different places and stone sculpture s ranging from 10th century up to 18th century are displayed respectively. Rare bronze and silver items belonging to 14th - 16th century are displayed in Bronze and metal ware Gallery. Gallery of porcelain contains about 160 items. This include porcelain or pots, Chinese dishes, cups etc. The exhibits of Epigraphy Gallery are stone inscriptions, copper plates, palm leaf records, grandhas, ’thora’ in goat’s skin in Hebrew language etc. Chariots Gallery (Raja Rada Dhrishyavedi) displays horse Carts imported from England and belonged to Maharaja’s of Travancore and Folklore and Folk Arts gallery contains some old musical instruments and clay models. The crown and jewellery Gallery was opened in 2001. This gallery contains about 197 items. Royal Crown and gold ornaments decorated with precious stones etc. are the exhibits of the jewellery gallery. It will be opened to the public only on Fridays, Saturdays and Sundays. Numerous species of flora including rare medicinal plants grow here. The museum premise has been converted into a botanical garden with exotic tropical trees from Central America to Australia . The huge area over which the museum is spread provides the facilities for recreation activities. There is a deer park in the palace complex which was started in 1992, and facilities for horse riding. A Centre for Heritage Studies (CHS) set up by the dept. of Cultural Affairs, Govt. of Kerala here, offers post-graduate diploma courses and short-term certificate courses in Archaeology, Museology, Conservation & Archival Studies. Photography is prohibited inside the Museum Buildings.